The 400m object has an unusual orbit that scientists say could only have come from beyond our neighbourhood. A small asteroid or comet is believed to be the first confirmed "interstellar object" to have entered our solar system from somewhere else in the galaxy. Moving between stars and occasionally passing through other solar systems, it is something scientists have long believed to exist. "This is the first such detection," said Paul Chodas, head of the Centre for Near Earth Object Studies. "We have been waiting for this day for decades." He said that while everything so far indicated the object was from outside the solar system, more data would be needed to confirm it. 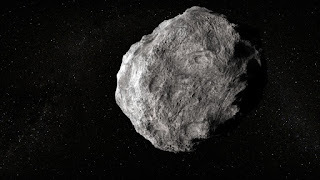 The asteroid or comet, about 400m in diameter and speeding at 27 miles per second, is thought to have entered our solar system on 2 September. 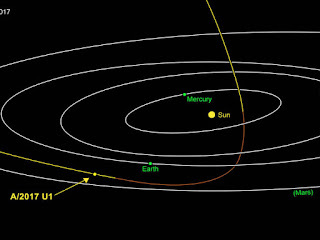 It then made its closest approach to the Sun seven days later, before taking a "hairpin turn" and passing about 15 million miles under Earth's orbit on 14 October. Astronomers are urgently tracking the object to try to know more about its origin and composition. It has the "most extreme" orbit that NASA scientist Davide Farnocchia has ever seen. He said it was "going extremely fast and on such a trajectory" that it is clearly "on its way out of the solar system and not coming back". By looking more closely at the route, the NASA team worked out more: that it had come from the direction of the constellation Lyra. "We have long suspected that these objects should exist, because during the process of planet formation a lot of material should be ejected from planetary systems," said Karen Meech from the Institute for Astronomy. "What's most surprising is that we've never seen interstellar objects pass through before." The first to realise something was unusual about the object was Rob Weryk at the University of Hawaii. He realised it came from the beyond after cross-checking images taken from the Canary Islands. The team then figured out its provenance by observing its orbit. It goes by the less-than-catchy name of A/2017 U1, but this might change because rules for naming such a new object have not yet been decided.